I recently read an OpEd in the Washington Post about the Liberal Arts and it reminded me of a post I wrote a couple of weeks ago about what I perceived as an ‘image’ problem for the Liberal Arts. The Liberal Arts are such an important part of education that I couldn’t imagine someone earning their degree without having had some exposure to the Liberal Arts. You learn such valuable skills that you might not get from other areas of education. This particular OpEd comes from a Professor at UVA who’s making the case for why someone should major in the Liberal Arts. There are a number of good reasons and I encourage you to read it, but I wanted to revisit the idea that we need to rebrand the “Liberal Arts.” Nothing’s changed in the last two weeks since I wrote about some of the issues with how people perceive the Liberal Arts based on the name (and their schemas around the word). My initial idea of “General Intellectual Capacities” is a bit of a mouthful and probably wouldn’t fit so well on a degree — ‘I majored in general intellectual capacities.’ I wonder if it might make sense to simply reorganize the way we talk about the Liberal Arts rather than try to change the name. Although, changing the name would certainly facilitate a new conversation about it. It seems like a herculean task to try to rebrand something as large as the “Liberal Arts.” What if we just thought about rebranding the Liberal Arts at one school? My first thought would be to take one of the colleges of the list of the best Liberal Arts colleges, but I suppose someone on that list might not want to undergo rebranding. They’re at the top of the heap and probably don’t want to shed the label that might be attracting students to their institution. What if we take a school that has Liberal Arts at it, but that this isn’t the main focus? A school that offers degrees in some of the Liberal Arts (history, political science, philosophy, languages, etc. ), but maybe has more of a focus on a different aspect of education. As I just came across a fantastic speech by someone, Georgia Tech comes to mind as a school we might use for this experiment. This university is world-renowned for its engineering program. It consistently scores in the top 5 for engineering in the US. 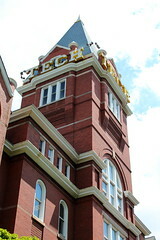 Georgia Tech has 6 colleges, one of which is called the Ivan Allen College of Liberal Arts. At this college, students can earn degrees in economics, international affairs, history, and public policy. All of these are staples of the Liberal Arts. So, the question then becomes, how do we get these engineers to broaden their horizons and take classes in the Liberal Arts or even minor in the Liberal Arts? Of course, I’m sure that there’s a “general education” requirement to a degree from Georgia Tech — as there is at every other institution — which will mean that students will have to take some Liberal Arts classes in order to fulfill certain requirements. There may be some students who are already interested in the Liberal Arts and are not dissuaded by the name. We’re not too worried about those students — it’s the ones who’ve heard “bad” things or been “brainwashed” to think that the Liberal Arts won’t help them become better engineers. To those students, explaining that these classes amplify one’s “General Intellectual Capacities” might do the trick. Unfortunately, that’s probably something more suited to ‘marketing copy’ and less suited to what we could rename the college. If I reflect on what the professor wrote for the OpEd in WaPo, he’s stressing how the Liberal Arts can aid in helping someone to the “Good Life.” That’s where I had the idea about becoming a better citizen. I still don’t know that the College of “Becoming a Good Citizen” is a good name, but I think we’re getting closer to something that might be more appropriate.